It's summer time and my feet are looking rough! It's hot so socks are off and flip flops or just bare is how I'm rolling. Sadly, this means my feet are toughening and cracking from the heat! I'm not a feet person in the first place, so having them look worse is not helping my feet aversion. 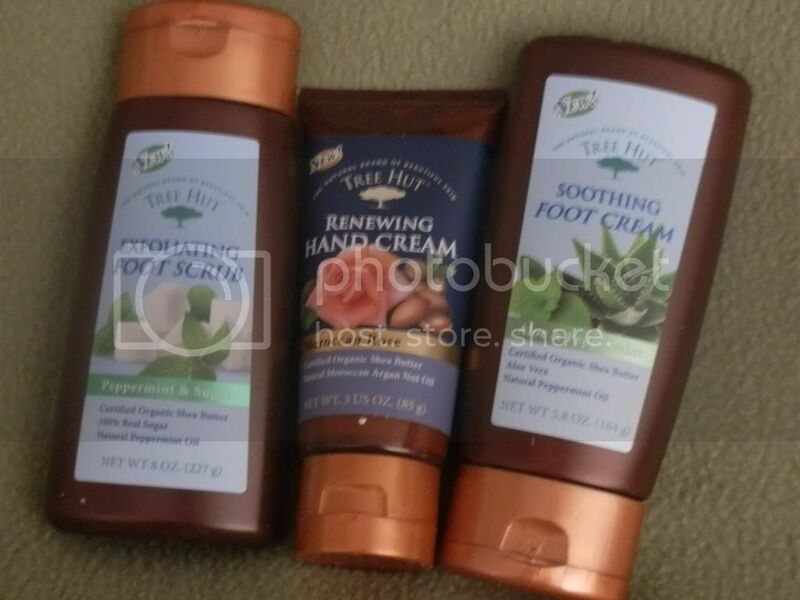 Mommy Moments with Abby's Review of Tree Hut's Exfoliating Foot Scrub/Soothing Foot Cream/ Renewing Hand Cream: I pumice daily and my feet still are cracked and gross, even for feet. To help myself out I've been trying to add creams and scrubs. I just started using the scrub with my pumice and have noticed that my feet are no longer black after I scrub them! Cracked, yes, but the feel smooth in the less damaged area's and smell like yummy peppermints! I love that smell, plus the aloe in the cream has been helping to ease the burn that my feet sometimes get when I walk outside on the Arizona pavement without shoes. I'd say these are definitely good foot products to check out! I love the smell of rose, so I'm a little biased when I say I love the renewing hand cream, it smells amazing! I've been keeping it on my island to use in between washing hands and my cuticles seem to be thanking me, which means my hands are retaining more moisture. Did I say it smelled amazing? Sorry, I just love the rose scent! I also love that my hands don't feel all oily as can happen with some scented lotions. They just felt moist and creamy! Refresh your tired feet with Tree Hut Soothing Foot Cream. Tree Hut’s Certified Organic Shea Butter, Aloe, and Peppermint Oil provide rich sources of vitamins and minerals to nourish and revitalize your feet. The sweet peppermint cools and refreshes so your feet smell as great as they feel. Soothe your sole with Tree Hut Exfoliating Foot Scrub. Pure sugar gently exfoliates dry, thick skin to a silky like perfection. Certified Organic Shea Butter and cooling Peppermint Oil moisturize and revitalize making your sole feel great inside and out. Moisturize your over-worked hands with Tree Hut Renewing Hand Cream. Kissed with Argan & Rose Hip Oil to provide natural anti-aging and healing properties, this rich, non-greasy cream leaves your hands feeling soft and revived.